Serve with bacon, Canadian bacon or sausage to help balance the sweetness. 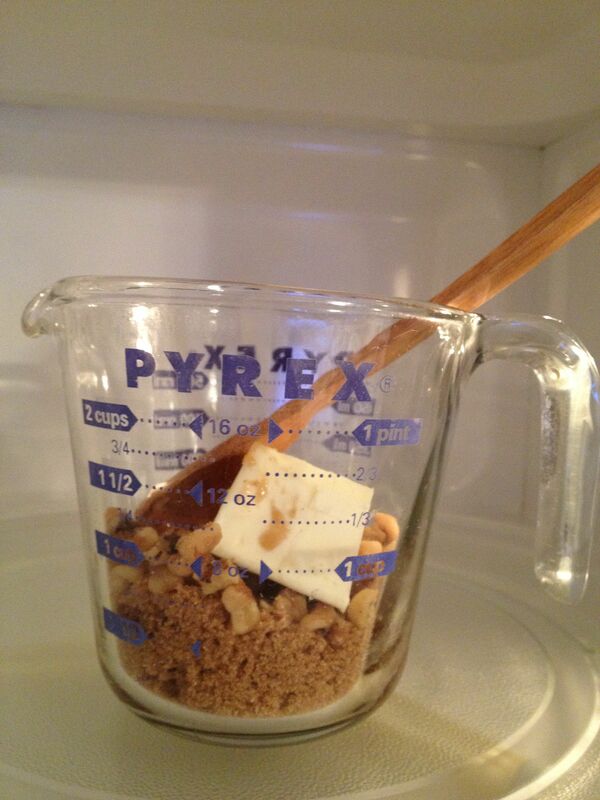 Combine all ingredients in a microwaveable bowl or measuring cup. Microwave 45 seconds; stir. 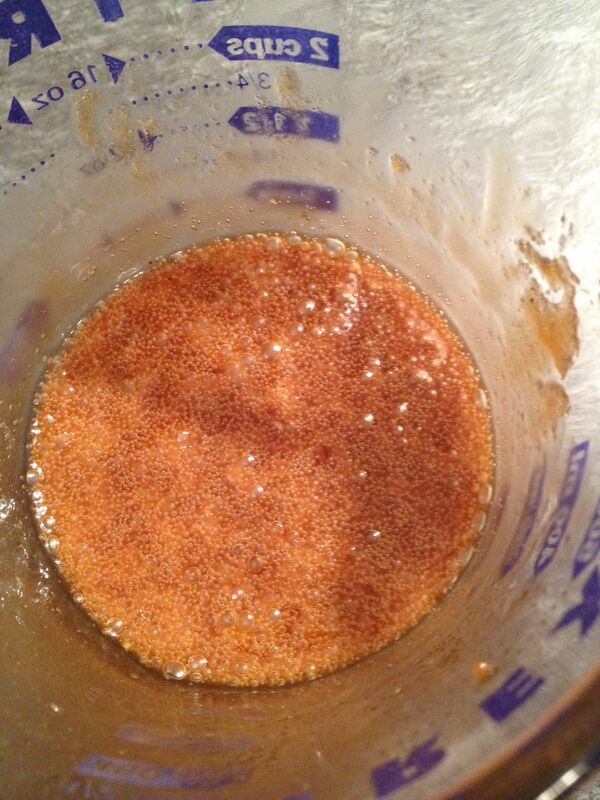 Microwave another 30-45 seconds or until bubbling and sugar crystals have dissolved. (Check this by taking a little taste.) 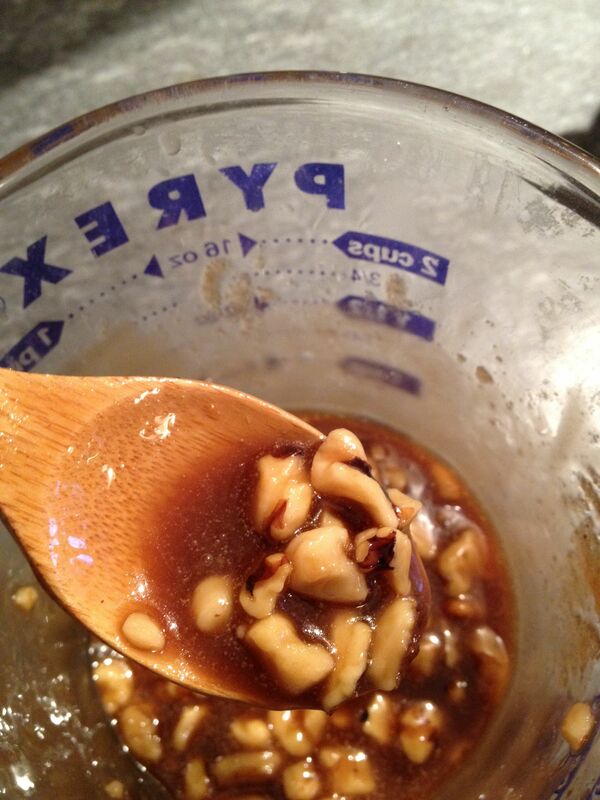 If too thick, add ½ tsp of water at a time to achieve consistency of thick maple syrup. 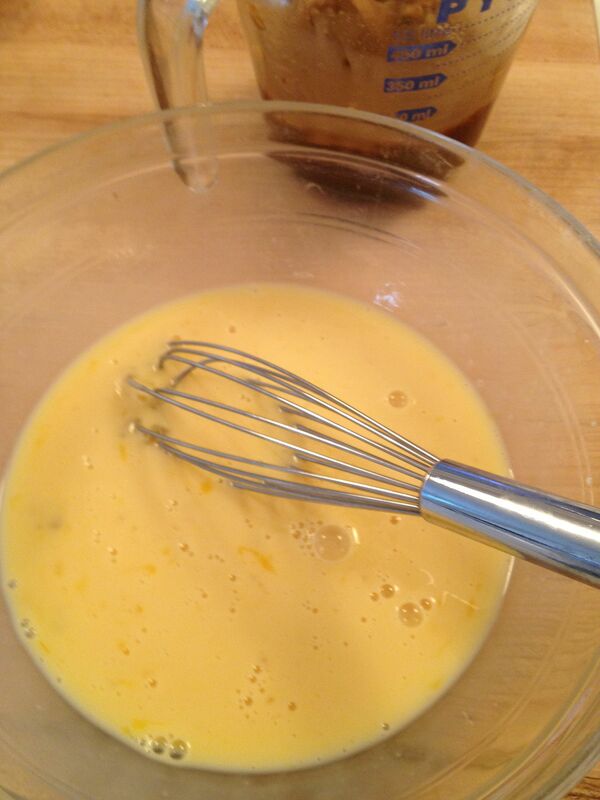 In medium bowl, whisk together eggs, milk, salt and vanilla extract. Heat a large nonstick pan over medium heat. Add bread slices to egg/milk mixture, turning to coat both sides and soak through to center of bread. (This may go quickly with soft, fresh bread or may take a little longer with drier, crusty bread; also note that the more saturated the bread is with egg/milk mixture, the longer it will take to cook.) Add a little butter to pan if desired; with a good nonstick pan you won’t need to, but it’s extra insurance against sticking if you’re not sure. Arrange soaked bread slices in pan – as many as will fit without touching. Cook over medium heat 3-5 minutes, or until golden brown on one side. (The toasts will “release” from the pan and flip easily when they’re adequately cooked; flipping too soon may cause them to stick to the pan.) 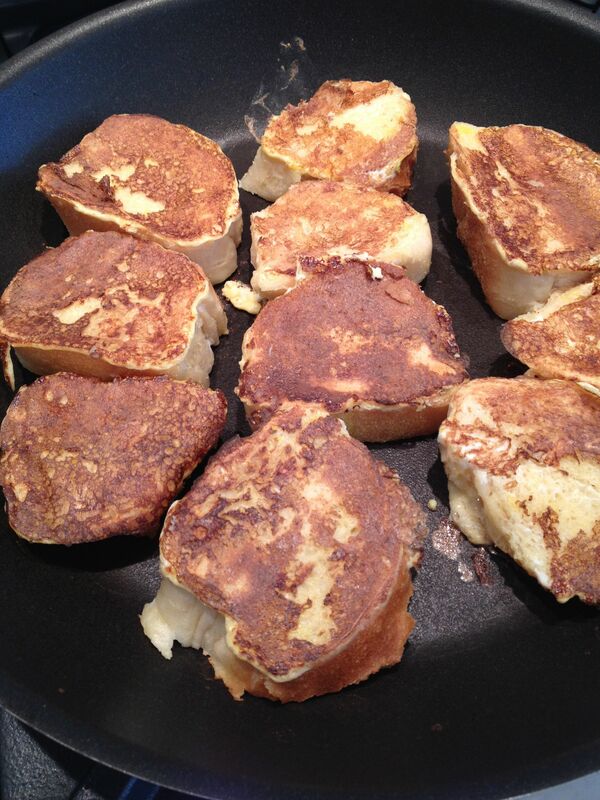 Flip and continue to cook on the other side until toasts feel springy to the touch (another 2-4 minutes more). Transfer to warm baking sheet and continue with remaining bread slices. Microwave sauce to reheat just prior to serving. 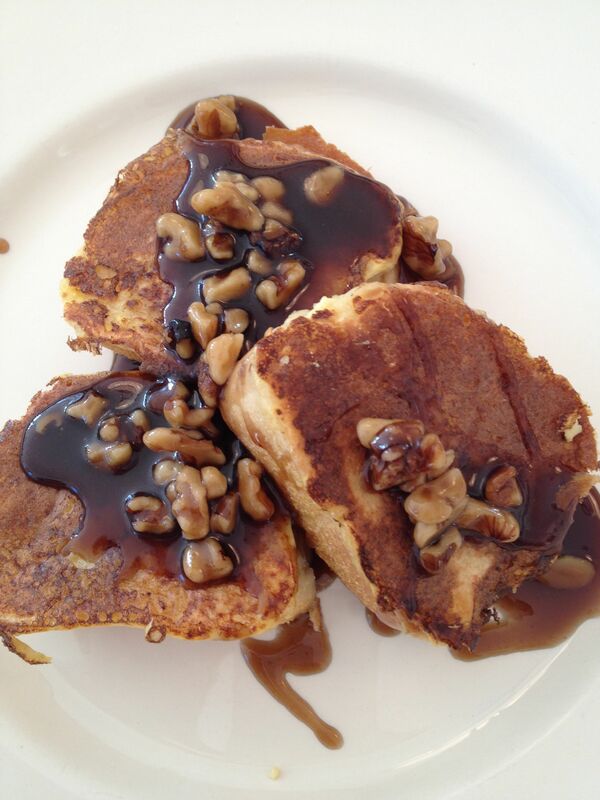 Arrange French toast slices onto plates and drizzle with sauce (or serve on the side). 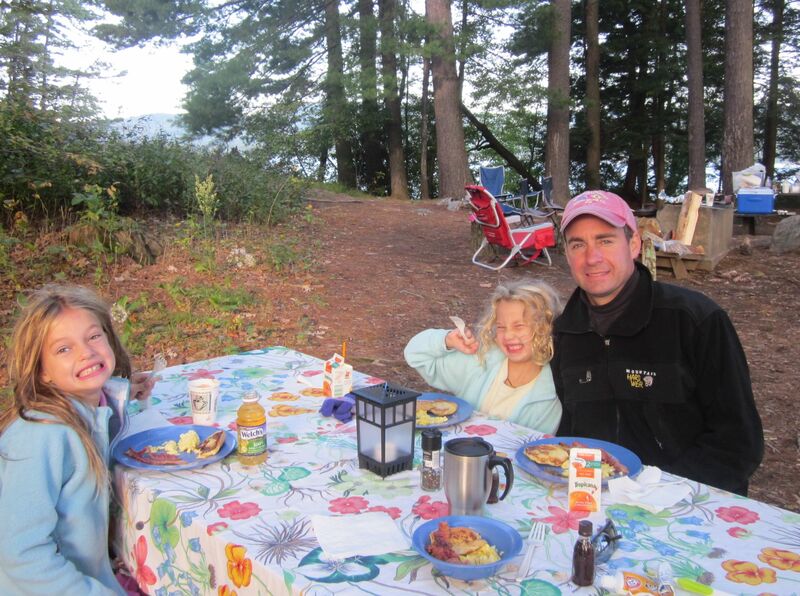 This entry was posted in Breads, Breakfast, Sauces and tagged bacon, breakfast, brown sugar, French toast, walnuts by subeeskitchen. Bookmark the permalink. The brown sugar sauce was AMAZING!! We used pecans instead of walnuts!!! That looks yummy ! I’m always looking for a vehicle to get the yum in… as a side note – not sure if you take requests, but you said you recommend doing the bacon in the oven. Do you bake or broil ? I broil, my mom says everybody bakes now. Huh ? I possibly eat my bacon a bit rarer than the norm, but I think broiling gets the fat away from the bacon and can make it as crisp (or not) as you possibly want. What do you do, Subee ? Inquiring minds want to know ! 😉 PS I’m going to the store right now to get some brown sugar for my suitcase !!! Salut, Kelly – Broiling bacon works, but it’s easier to burn if you don’t pay close attention. Baking at 400F is more foolproof. Still gets the fat rendered and the bacon crispy! But if you want the most greaseless option, microwave it on paper towels (about 3 mins. for 6 slices; more slices = more time); cover top layer w/paper towel to prevent splattering all over you microwave. A bientot! Made it this morning Sue and it was a huge hit!! I think Declan had 6 pieces! Thanks for a great recipe.